When: Sun 14th – Tues 16th Oct 2018. Where: The Woodenbridge Hotel, Avoca, Co.Wicklow. Call 01 2810060 to Book. We are delighted to be hosting another 3-day sewing retreat. We’ve been searching for the perfect venue in Wicklow and we are so happy to have found the gorgeous Woodenbridge Hotel. Our retreat is aimed towards anyone who would love to just leave it all behind for a few days and spend lots of time sewing, eating delicious food and really relaxing in beautiful surroundings. How would you like to settle in for a lovely long sewing session? The kind where everyone around you is excited to learn and sew. Where you can see how different everyone’s work is and chat with them about colours, patterns, techniques and our common obsession – buying fabric! The kind of session where you know you’re coming back to your machine straight after lunch or dinner and just the thought of it makes you giddy?! 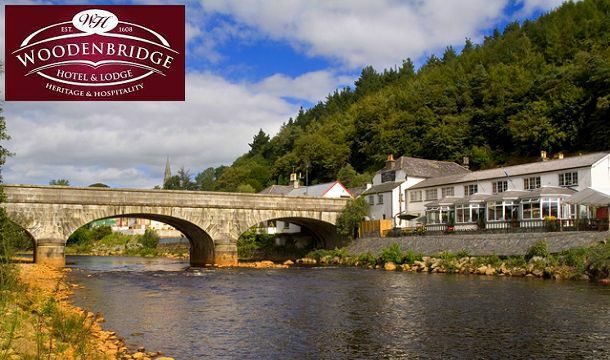 Well, you are more than welcome to join us, we would love to welcome you to The Woodenbridge. We do have limited spaces and are almost fully booked. If you would like to join us call us on (01)2810060 to secure your spot. Booking closes Saturday, July 6th Oct, but we expect to be booked out before then. So what should you expect when you join us on retreat? – Win some really cool prizes in our quilters raffle. Focusing on the fun and positive atmosphere of a group of women working and learning together, Sew Escape is open to everyone, regardless of experience. We do ask that you have some sewing experience and know how to use a sewing machine. Other than that, whether you have never made a quilt before or if you’ve made hundreds, you are very welcome. The retreat will be a calming and relaxing space (mostly!). We are well aware that everyone works at a different pace so there is no pressure to keep up, just enjoy the process and ask all the questions you like. There will be set meal times however you are free to get up and wander about, go for a walk outside, go for a nap if you like! You can even pop into the bar for a tipple of your choice, conveniently it’s right beside our work room! We will have a choice of 3 different quilts for you to choose from. They are all suitable for using pre-cuts however they can be easily made with long quarters or other cuts of fabrics. You will receive your list of requirements with your welcome email prior to the retreat. Starting on Sunday, July 14th, running all through Monday and finishing on Tuesday afternoon, we guarantee you will get loads of sewing done and have a wonderful time while you are here. The hotel have arranged a rate for those who would like to stay extra nights so you can tell your families/employers that the retreat runs for a full week if you like, we won’t tell. We have run retreats several times now and we love them! They are relaxing, fun and inspiring. We have many happy students who have spent time with us at retreats and love to return when they can. In fact many have already re-booked for this one. We will have space set aside to lay out large quilts for basting and pinning. There will be several ironing stations around the room too. All materials and waddings, threads etc in the shop will be available to you at a 10% discount and of course, we will be available to you to answer any questions and assist you in any way we can. Our Sew Escape will begin with an introduction and settling in on Sunday from 12 noon and end on Tuesday 17th at 4pm. We will provide you with a welcome pack, your pattern for your chosen project and any other info you may need. You will book into your room and set up your machine in the sewing room before joining us for lunch in the hotel. After lunch, the fun will really begin and will not stop until it’s time to leave. The accommodation in the hotel is very comfortable, we have checked out the rooms and sampled the food. We are confident they will look after us very well and hope this will be the first of many retreats in The Woodenbridge, we have already booked our next one for this October. So how much does all of this cost? Well for 2 nights accommodation, 2 breakfasts and 2 evening meals, including all tuition, you pay €405 per person sharing. The hotel charges a €34 single supplement. We recommend booking soon to get your preferred room. We require a deposit of €50 upon booking and a balance of €190 paid 2 weeks prior to retreat beginning, these can be paid to us in the shop or over the phone. The remaining amount of €165 plus any added extras is paid direct to the hotel upon checkout. You can now book your own private retreat! We can cater for groups of up to 6 people in the shop and up to 20 in a suitable location so if you would like to book your exclusive retreat please email us at [email protected] or call us on 01 2810060.